Happy New Year, cardmakers! I hope you resolve to do lots of sketch cards this year ;)! Today's sketch is a great one to get started, if you've never done a sketch card before. Quick reminders: all OWH sketches are designed for A2 sized cards since that is what we prefer (4.25" x 5.5") and the heart shape indicates the embellishment of your choice, it does not have to be a heart. This week we are celebrating our former shipper Dixie, as you may have seen on the Midweek Throwdown post from Wednesday. More Dixie for us today, and this time she made the cards! She has three adorable sample cards for us this week. You can read more about them and her other beautiful work on her blog, What's Next? Thanks for the awesome samples, Dixie! Thanks so much for two years of nonstop shipping, too! Have some ideas for this sketch now? Get busy and be sure and come back here to show us what you make! Great samples Dixie! I think the heart is my favorite... so clean and crisp with just enough detail but all 3 are nice interpretations of this sketch. Well done! Great cards to start to a New Year! Thanks for the inspiration. I'm off to work but hope to get back to card making in the next day or so. 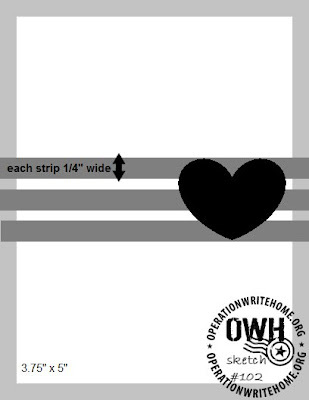 What better way to start but with an OWH sketch. 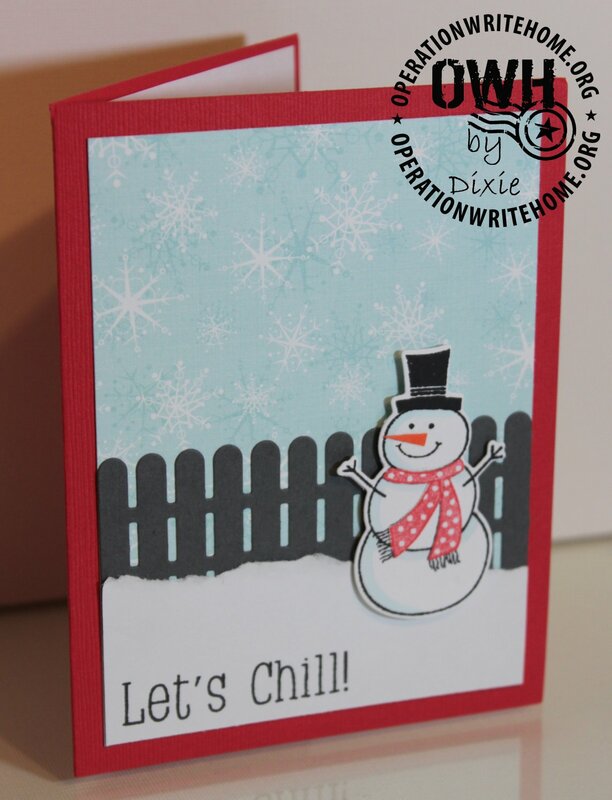 Love Dixie's cards. Have a Happy New Year! Wishing everyone a wonderful start of 2012! Let's hope this is a very peaceful year and that all of our troops come home safe and sound! I'd also like to wish you all a year full of fun, creativity, laughter and lots of LOVE!! What a fun sketch.. just printed off a copy and am off to make something. Dixie, your samples are wonderful... I really like the "heart" one and was surprised to see that you made one with a heart.. yeah you! What a fun sketch! I'm hoping to play with it soon. Dixie, these are all wonderful sample. I especially like the one with the heart. Dixie this is a fun sketch. I like how you something a little different with each card. The first one is my favorite -- clean and crisp. Thanks for everything you do. Much appreciated. WHAT?!?!? Dixie made a card with a HEART?!?!? Go Dixie!!!! All these cards are beautiful, but the snowman is my fave!! Oh my goodness! I have been looking for a card challenge that was related to our soldiers and I just found you! I will definitely be getting involved. Thanks for the challenge! Beautiful cards Dixie! So glad to see more of your beautiful artwork lately! Isn't it fun to have time to "play"? Those cards are so cute..I am going to CASE the house one since that's my fav and I have that set. Dixie, all 3 cards are wonderful! 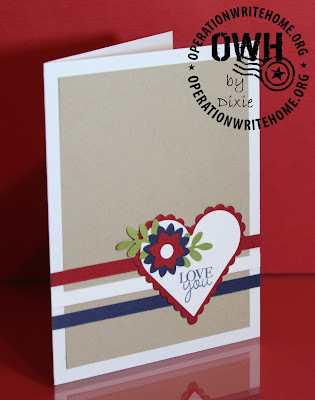 I love the red, white & blue strips on the heart card, the gorgeous house card (I want that set!!) and the cute cute fence and snowman! Awesome. Dixie, great sketch to start the new year. I adore all your cards but my fave has to be the snowman... love it! 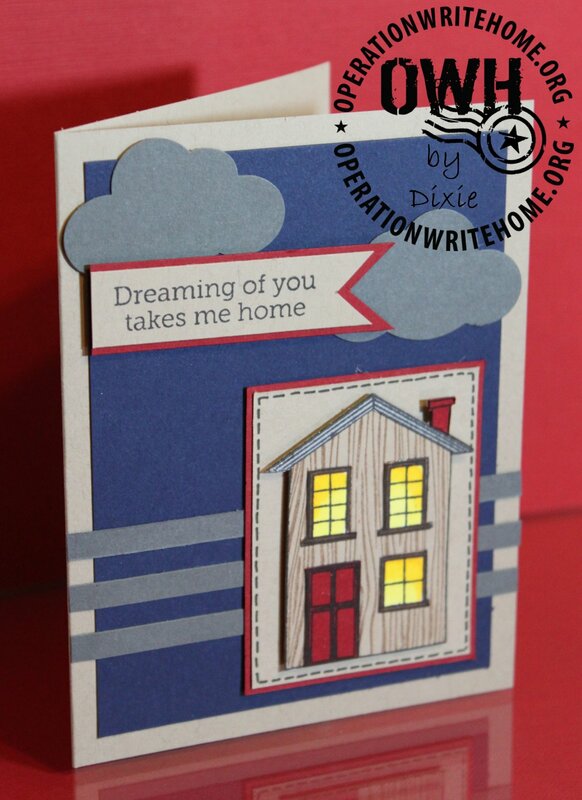 Thanks for inspiring us with such great card samples Dixie! They're all fabulous! @Susie, there should be a red "x" beside your name. You click on that to delete. Susie, I deleted it for you from the administrator's tools. Thank you Julie. Have a great day!